Please stop reading this review and rejoin us when conversation turns to a discussion of the great Blind Lemon Jefferson or Son House. 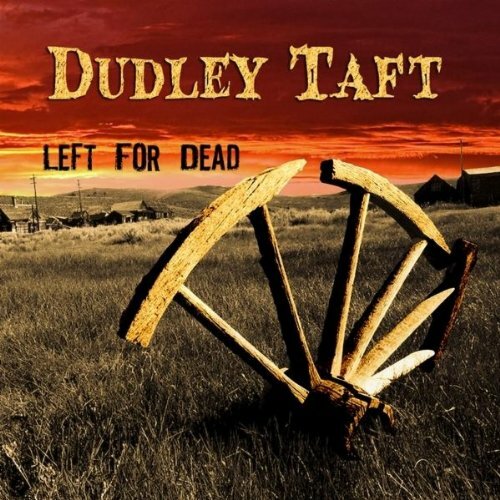 Dudley Taft will be unfamiliar to most of the blues cognoscenti. The path that brought Left For Dead to listeners doesn't include stints playing second guitar for Pinetop Perkins or B.B. King. Taft cut his musical teeth in the Pacific Northwest in bands like Sweetwater and Second Coming, the latter having direct ties to the amazing Alice in Chains, whose members he counts as friends and with whom he often performed. He may not have been the ideal candidate for a blues album but he isn't the type to let others make decisions for him. In addition to his hard rock roots, Dudley comes through the Taft line that produced a President of the United States and a family that has found success in law, business, and sports ownership. He could have followed that path but chose the musician's life instead. It's an odd resume for a would-be bluesman but this is the 21st century; we've grown accustomed to artists and musicians recycling, repackaging, reimagining, and reinterpreting the idioms and ideas of the past, moving forward and backward along the artistic timeline. Left For Dead is a hard-hitting, nitro-fueled collection of Texas blues that has more inspiration than imagination but there is diversity within. This is not a Delta-soaked, trad blues album yet Taft summons the ghosts of Robert Johnson's hellhounds. He possesses a great rock voice and is a powerful complement to his nuclear guitar licks. "Back Door Man" has been covered to death but Taft rocks it harder and hotter. He frees himself from the shackles of its familiar arrangements, matching the lyrics to a riff that has more in common with Stevie Ray Vaughan's "Crossfire" than previous versions. "Ain't No Game" has a ferocious stomp that stops short of being a Pantera-esque Cowboys From Hell moment but the octane level doesn't miss by much. Not everything hits like a heavyweight's fist. The title track slows the tempo and eases the fury, allowing the lead guitar to have a prettier tone that soars. He also takes a little edge off the vocal, giving some variety to his attack. "When Your Way Gets Dark" blends clean, acoustic picking with some slide lead and chugging electric chording beneath. The shuffling rhythm play on Willie Dixon's "Seventh Son" is more nimble than some of the leaden, rock rhythms elsewhere and fits well alongside cuts like "Left For Dead" and "Devil's Crown." His gritty voice is an asset suiting the bulk of the material but there are times – particularly on his version of "Have You Ever Loved A Woman" –he sounds like an alt-rocker trying to sing the blues rather than a blues singer. He bolsters that cut with extended guitar solos, preventing this from being a misstep. Only the rote "Blue Lady" falls short. The playing is good but vocal execution and common imagery make this feel generic compared to more inspired moments. Taft is a forceful presence and Left For Dead provides ample proof his career left turn is taking him the right direction.